Hotel Leela Palace Bangalore, Leela Palace Hotel Bangalore, Reservation for Hotel Leela Palace, Bangalore, India. 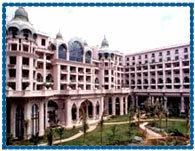 Address: 23, Airport Road, Bangalore- 560008, Karnataka, India. Accessibility: 45 kms. from Bangalore Airport, 10 kms. from Railway Station. Hotel Leela Palace and Resorts is four of India's finest deluxe hotels, set amidst 9 acres of lush green gardens and a sparkling lagoon in the garden city of Bangalore. Hotel offers a great attribute of comfort, technology and design, alongwith the regal ambience, combines to provide outstanding service to the world's most discerning business and leisure travelers. Hotel offers 357 elegant and spacious rooms and suites facing either the swimming pool or the gorgeous green gardens. 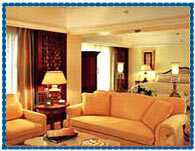 All the rooms are well-appointed with luxurious items. World's Finest Club Floors, Large Business Desk in all Rooms, Electronic Safe, 2 Line Telephones, Fully Stocked Mini-bar, Broadband High Speed Internet Access, Business Centre, Concierge Services, Round the Clock Butler Service, 24 Hour In-Room Dining, Laundry & Dry Cleaning, Limousine Services, Board Rooms & Meeting Rooms, Asia's Premier Spa, Outdoor Swimming Pool.